The Washington National Primate Research Center supports outstanding research directed towards significant human health issues and nonhuman primate health and biology. In order to accomplish this mission, we carefully monitor the health and well-being of our animals. We are proud of the high quality animal care that is provided by our personnel. The BioBulletin newsletter will include interviews with various staff to help explain their roles in the Center’s scientific mission. The following is an interview with one of our clinical veterinarians. What factors led you to a career as a veterinarian? I’ve always loved keeping pets and spent a lot of my childhood learning how to breed and provide husbandry for a variety of animals (fish, turtles, rodents, parakeets, etc.). I also enjoyed science and anatomy in school. It just seemed natural for me to become a veterinarian, so that’s what I did! I had very supportive parents and grandparents too – they let me keep a lot of pets when I was young, and they helped support me through veterinary school. I could not have done it without them! Tell us a little bit more about your background and education; and how it contributes to your foundation in primate care? I completed a 3 year fellowship in Comparative Medicine at Johns Hopkins University in Baltimore, MD. During my residency, I gained experience managing macaque and marmoset breeding colonies and provided surgical and anesthesia support for a variety of large animal models. I also received good training in anatomic pathology for a variety of laboratory animal species. Finally, I received extensive training in the management and veterinary care of rodent colonies. Sometimes I miss working with mice! What is your role as a veterinarian at the Center? I am the clinical veterinarian at the Western facility, where I provide clinical care to breeding macaques, as well as to animals on transplant and infectious disease studies. I also am a part of the research support team. How do you support the research conducted at the Primate Center? The veterinary technicians and I provide anesthesia support for all research projects. Additionally, I perform surgeries required for the studies, including laparoscopic biopsies, gastrointestinal surgery, and placement of indwelling vascular catheters. I’m also involved in selecting animals for studies based on their clinical history and infectious disease status. Finally, I help researchers and support staff with protocol review and development. What challenges are you working to overcome? I’m still in “resident mode,” and I need to transition to “senior veterinarian mode.” This means I’m not very good at managing my time effectively! I want to be involved in so many aspects of research support and veterinary care, but I need to learn to better delegate some of these tasks to others. What are your vet-related goals for the rest of 2017 and the future? My immediate goal is to further train the veterinary technicians in anesthesia and minor surgical procedures. Overall, my goal is to provide exceptional research support by improving my surgical skills and furthering my knowledge of macaque transplant and infectious disease models. What should Center personnel and the public know about animal care at the Primate Center? I want others at the Center and the public to know how much we care for these very special and important animals. We become very close with many of the animals on study, and we go to great lengths to ensure their comfort and welfare. We learn their personalities/quirks, provide them with all forms of enrichment (treats, television, toys, etc. ), and care for them as we would our own pets! Dr. Moats took the certifying board exam through the American College of Laboratory Animal Medicine (ACLAM) in July of last year. The ACLAM certification examination determines qualification in laboratory animal medicine, a recognized specialty within veterinary medicine. The College’s position is that all those individuals who pass are equally qualified, so numeric scores are not released. Candidates who pass the examination are granted the title of Diplomate. Dr. Moats was awarded with the Foster Award as the individual receiving the highest grade on the written and practical exams. ACLAM Diplomates are certified specialists in the field of laboratory animal medicine. They provide medical care and management to a wide variety of animal species used in medical, veterinary medical, and biological research and testing. They have unique qualifications which enable them to serve as valuable members of the research team. ACLAM is recognized officially by the American Veterinary Medical Association (AVMA) as the certifying organization for laboratory animal medicine. What strategies did you utilize in order to balance your work duties and studying for the boards? I made a strict study schedule well in advance, and I stuck to it. Also, I summarized all of the important test material so that it was easy for me to understand and review later on. The exam focuses on the clinical care and pathology of a variety of laboratory animals, including non-human primates, rodents, rabbits, zebrafish and swine. The exam also tests your knowledge of the regulatory documents related to animal research, such as the Animal Welfare Act/Regulations and the Guide for the Care and Use of Laboratory Animals. Do you have anything to add about your mentor, Dr. Bob Adams? 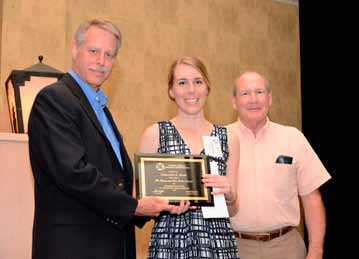 In April, ACLAM President John Bradfield presented the Foster Award for Academic Excellence to Cassie Moats along with her mentor, Bob Adams. Bob Adams was a great mentor and continues to be a good friend. He has exceptional knowledge and experience breeding macaques (including pigtails), and is a very practical and skilled clinician. I was so honored that he could make it to Arizona to present me with the award!